The Ada County Jail was built in 1977 when the Ada County-Boise City Public Safety Building first opened. The jail was originally built to hold a maximum of 160 inmates, plus 32 work release prisoners. The jail has been expanded several times since then. Today, the total inmate capacity is 1224. All inmates at the Ada County Jail are classified using a specific system which is basically a risk assessment. By classifying all inmates, security of other inmates and jail staff is greatly increased. To classify an inmate, a team of officers researches the inmate’s past and criminal history. They also consider the inmate’s past and present behavior when in custody. Mental or physical disabilities are also taken into consideration when determining appropriate housing. Inmates are assigned a security risk level, or classification, ranging from minimum to maximum. Minimum security inmates enjoy the highest level of benefits and privileges. Medium security inmates may also have certain privileges, like dormitory housing and access to programs. Inmates who are classified as maximum risk do not have access to most programs or privileges. 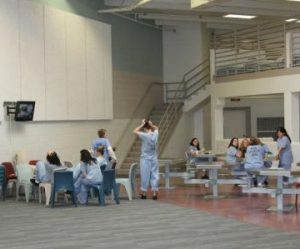 There are different types of inmate supervision used inside the Ada County Jail. One is called Close Custody Unit (CCU). CCU can house a total of 130 inmates. This is the traditional cell structure where more violent offenders or those inmates who cannot be mixed with the general population are housed. Other inmates live under what is referred to as Direct Supervision. Their housing is set up in “pods”. Within each pod are dorms. Each male dorm holds 92 inmates. Each female dorm houses 56. In dorms, there are no single cells. Inmates have their own beds and they all share a common area. Generally, one deputy is able to supervise an entire dorm.